Hawkman and the Atom reunite again in the Microverse for an adventure. They must find another one of Hawkman’s past lives totem hidden there. But first, they must deal with the sentient planet where the totem is hidden. Can they survive a fight against a whole planet? I have not been impressed with this Hawkman run until this issue. This issue is more than a quest. 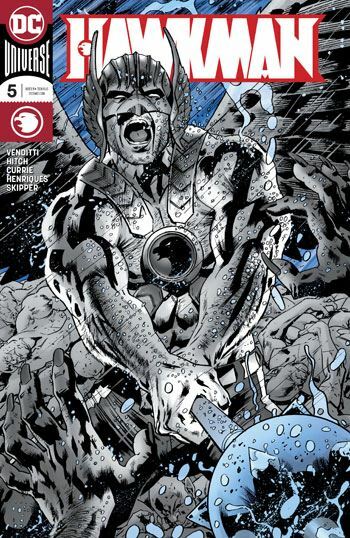 It’s also an adventure with a more solid plot and perhaps, less of the annoying continuity problems that the writer keeps adding to Hawkman, as if the character needed a more muddied history than he has. Robert Venditti has been able to convey the genuine friendship between Hawkman and the Atom. Even Bryan Hitch’s artwork whom I’ve been very critical of in this series is delightful this issue. The inking is stronger and the Microverse setting apt for Hitch’s style. While I continue to dislike how he draws Hawkman’s helmet, Hitch’s Atom is very fine-looking.